There is a large and growing need for a well-trained regulatory science workforce to advance the translation of research into clinical interventions. 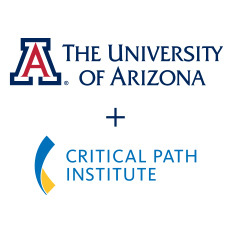 That’s why C-Path is participating in the development of this interprofessional graduate certificate program conceived in collaboration with industry leaders in regulatory science, along with University of Arizona academics across the Colleges of Law, Pharmacy, Public Health, and Medicine. The curriculum is designed to equip students and working professionals across multiple disciplines with basic competencies in regulatory science. The certificate competencies cover policies, ethics, and processes, including pre-clinical studies to post-marketing responsibilities. This specialized training will uniquely prepare graduates to facilitate and lead innovation across medical product development. Graduates of the program will be able to advance their careers with this training, or transition into the regulatory science field or related discipline. Join an internationally-recognized, one-of-a-kind graduate program in Regulatory Science at the University of Arizona James E. Rogers College of Law. Designed for pharmaceutical and medical device professionals, policy makers, business leaders, scholars and current students, this certificate enables you to advance current practices in medical product development by learning the ethics, policies, and regulations at federal and global levels. The unique coursework reflects a partnership with faculty experts and industry leaders to provide students with specialized training to lead innovation across medical product development. Students will learn what goes into creating drugs, biologics or devices and the legal and regulatory principles governing them, to make an impact in the biotech and pharmaceutical industry. In as few as 12 months, advance your career in the Regulatory Science field. The flexible program is designed to be completed at your convenience and is 100% online. There is no entrance exam, and all of the courses offer focused, individualized guidance and feedback, as students progress through the program. The 13-certificate credits can all be applied to the Master of Legal Studies. This course explains the ethical principles underlying regulations and guidance governing clinical trials, especially as the principles pertain to informed consent, risk-benefit disclosure, and conflicts of interest. The course also outlines the elements and design of clinical trials, including federal regulations for research with human subject participants, with vulnerable populations, and international research ethics. The course concludes with research ethics in big data. This course navigates the drug development path stretching across the pre-clinical and post-marketing divide to cover the full range of drug regulation, including drug discovery, innovative drug development tools, and the post-approval phase. Intellectual Property protection and evaluation will be covered, along with FDA-enforced market exclusivity and FDA-expedited review programs. The course concludes with international regulatory perspectives, including the European Medicines Agency, the costs involved to bring drugs through the clinical trials to market in the US and abroad, and how this affects future investment and strategy. There are numerous needs in regulatory science that companies are faced with every day. This course provides an opportunity for students to integrate and apply their knowledge and skills to real-world challenges in regulatory science. Industry leaders will present case-based projects where students will work in teams to discuss and problem-solve multi-faceted issues on a current or emerging topic in regulatory science. Students will consult scientific priority areas and consider strategies for developing new tools and approaches for improvement of safety, efficacy, quality and performance of FDA-regulated products. This course explores the intersection of regulation and science, focusing on how regulators at federal and state levels can best accommodate science and how science can best be practiced to satisfy regulators. The course discusses the role of executive agencies such as the Food and Drug Administration (FDA) in ensuring safe and effective products to promote public health, different mechanisms executive agencies use to increase compliance, and current challenges for enforcement in a globalized world.